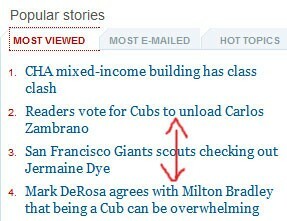 This is following up on the heels of Phil Rodgers's column which suggests that the Cubs waive Zambrano. I know that Zambrano is crazypants and kind of a jerk (per Rodgers, he was clearly trying to hit DeWayne Wise), but... chill. Let's do some comparisons. Mark Buehrle, 30, 1947, $14M, 3.26 ERA. The pitcher who compares most unfavorably to Zambrano is Dan Haren, who is the same age, has pitched 200+ IP for the past four years, has a 2.25 ERA, and is making $7.5M this year. But those who've acquired Haren have had to pay a steep price in talent (if you count Mark Mulder, of course). Is Zambrano overpaid? Compared to Buehrle, Santana, Sabathia, and Haren, of course. But how overpaid? For a maniac, he's amazingly consistent - he's never had an ERA over 4.00 while starting no less than 30 games since the age of 22. In Baseball Prospectus's subscribers-only section, they describe him as basically somewhere between a subpar ace and a very good #2 starter, which seems fair, and would make him overpriced. But the Cubs overpaid for a very reliable (for good and ill) investment - a known quantity. Perhaps not the best decision, but not worth this week's freakout.